The Soho Theatre introduces the best in new writing talent for a broad spectrum of audiences, encompassing plays, late night comedy and cabaret, and a vibrant talks programme. 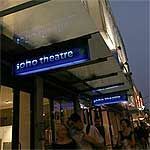 Do you work at Soho Theatre? What did you think of Soho Theatre?